About the opening of the new MMC Testing Center, if we were to say it was "long-awaited and highly anticipated," we would have used up one cliché too many. However, sometimes only clichés are best able to tell the story. 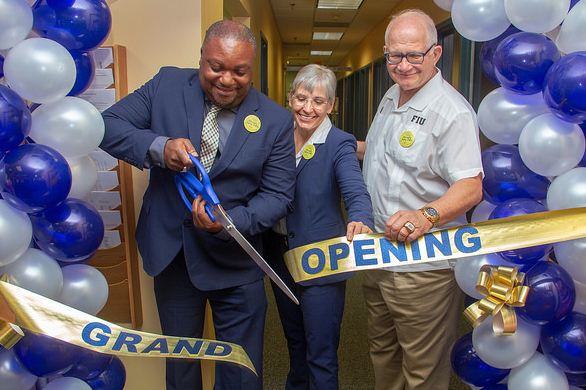 Thanks to the efforts of various advocates and collaborators, including a timely technology-fee grant, the University Testing Center has undergone a convenient relocation, and expansion from a 10-seater in PC 415 to over 50 seats in GL 120. The big reveal, which includes technological and security enhancements, took place on August 23rd, 2018 at 1:00PM. 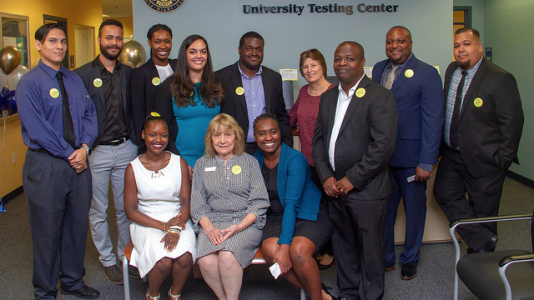 The Testing Center is now well-positioned to welcome FIU and its neighboring communities to the newly minted facility. On Friday, June 22nd, FIUTC celebrated take your dog to work day by welcoming an energetic 8-month-old American bulldog named Carter. With a big appetite and warm heart it was no surprise that all of FIUTC fell in love with the Humane Society adoptee. It was unanimous! Carter is now our Testing Center mascot. Look out for the bulldog's fun pictures and Carter goings-ons. Florida Statute (1007.25) has been established in response to declining levels of civic literacy. To address the new rule, the Florida Board of Governors (BOG) in March of 2018 initiated regulation 8.006 to help institutions comply with the new Civic Literacy requirement. Beginning in the 2018-2019 school year and thereafter all first-time-in-college (FTIC) baccalaureate-seeking students entering a State University System (SUS) institution must satisfy the new requirement. 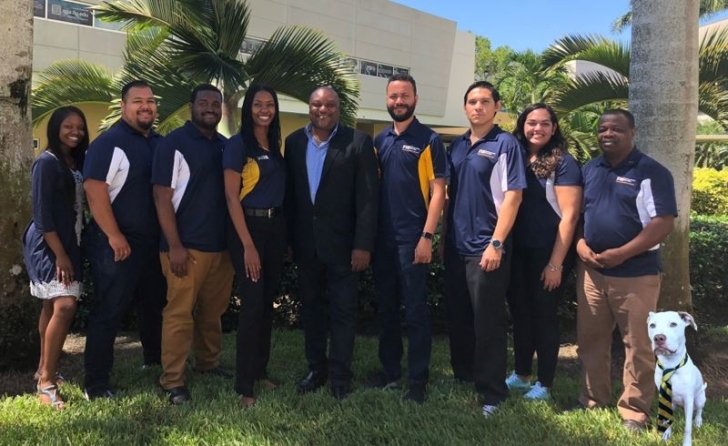 No undergraduate degree-seeking student admitted during the aforementioned period and thereafter may graduate from FIU without first having met this requirement. Both the CLEP– American Government and FCLT will be administered through the University Testing Centers at MMC and BBC. 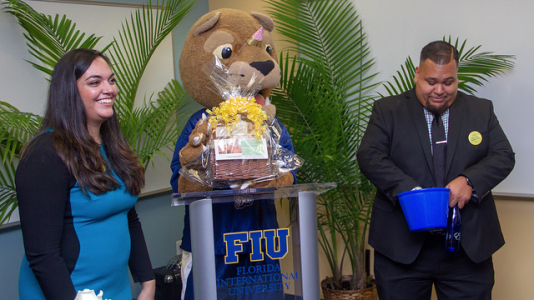 For more information, visit https://testing.fiu.edu. In light of FIU’s implementation of its own Math Placement Model (MPM), the method by which all incoming students without prior college math credit are placed into an appropriate math course as of summer 2018, for some, the ALEKS placement test still remains an option. ALEKS is a web-based artificially intelligent system that uses adaptive questioning to determine exactly what a student knows, doesn’t know, and is most ready to learn. Students who strongly believe they possess advanced knowledge and are dissatisfied with their MPM score may challenge the score and opt to take the ALEKS exam. In addition, students who have not taken any math courses and have expired ALEKS scores (scores expire after 18 months) should retake the exam at the earliest opportunity. Every ALEKS attempt is proctored and can be taken at the University Testing Center at either MMC or BBC (GL 120 or ACI-160 respectively). The testing center’s proctoring fee will be waived; however, students will be responsible for a $15 ALEKS Corporation fee for each attempt. In the rare event that remote proctoring is necessary, ProctorU may be selected for virtual testing at a location of one’s choosing. It should be noted that any ProctorU charges will apply in addition to the preset ALEKS Corporation fee. Exam results will be accessible within the ALEKS accounts of students upon completion and will be available to academic advising within 24-48 hours. Students can register to take the ALEKS by going online to https://testing.fiu.edu. In the continuous attempt to remain responsive not only to the needs of our students, but also to our surrounding communities, FIUTC is embarking on the addition of the Criminal Justice Basic Abilities Test (CJBAT) provided by Industrial/Organizational Solutions (IOS). Looking to earn college credits faster and at a lower cost? The FIU Testing Center has teamed up with Prometric to provide the DSST exams. 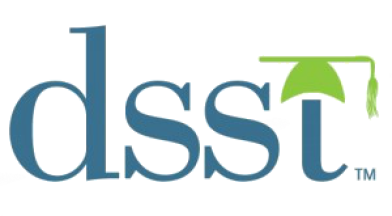 Similar to CLEP, DSST offers upward of 30 exams designed to assess what students already know. While the exams were previously offered only to military personnel and their families, now any individual seeking college credit for knowledge gained outside the traditional classroom may register for and take a DSST exam. Aside from its cost-saving benefits (military personnel test free for the first attempt), successful completion of one or more DSST exams can dramatically reduce the time it takes to earn college credits allowing students an accelerated path to graduation. Effective July 1, 2018, the CLEP fee was increased to $87 per exam. If you purchased your exam registration ticket before July 1, 2018, your fee, at time of purchase, will still apply to all registration dates until your expiration date. If you have any questions, email College Board at clep@collegeboard.org. Effective July 1, 2018, the fee for the ATI TEAS increased to $90. Please visit our website at http://testing.fiu.edu to register for your ATI TEAS exam and for any questions, email FIUTC at bbctesting@fiu.edu or testing@fiu.edu.